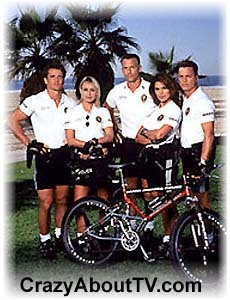 The Pacific Blue TV show was a 60 minute, crime,drama series on the USA Network about an elite team of young bicycle cops who patrolled Malibu Beach in order to protect the peace and apprehend those who committed crimes while tantilizing audiences with their hard bodies in tight shorts and t-shirts. The "Blue" in "Pacific Blue" stood for the color of the bicycling cops' uniforms. Pacific Blue was filmed on location at both Venice Beach and at Santa Monica and Venice Beach. Pacific Blue was created, written and produced by Bill Nuss who was also the writer on another young cop series titled, "21 Jump Street". Thank you for visiting our Pacific Blue TV show page!